Today was a panto day using my Shirley Stitcher robotic system. Now, for some reason, I find the nest feature a lot of work to get it to come out right. Maybe it's just me! So I devised a system for nesting that works for me, and I'll try to explain it here. First, this technique requires either an actual size printout of the panto design, or after one row is stitched, a tracing the stitching onto clear vinyl. It doesn't have to be the entire length, just a good 12" of the beginning, especially the top portion. 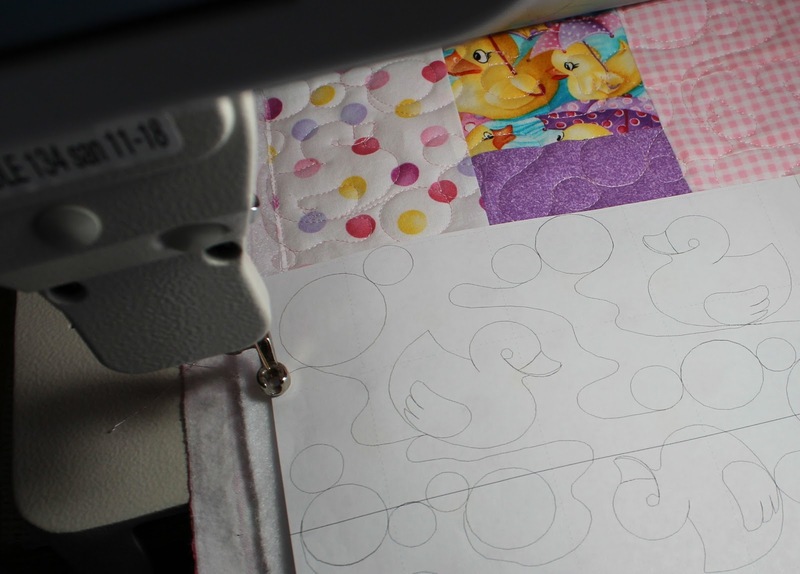 I digitized ducks and bubbles for this quilt, then printed out the beginning portion from my editing software. To also make my quilting life easier, I sized the length of the panto in the editing software to be a about an inch longer than my quilt top. That way no resizing was necessary in the Shirley Stitcher, and therefore the paper printout would match up with what Shirley was stitching out. I set up the design, having an approximate stitch off the sides of 1/2 inch, then stitched it out. Now comes the nest part. Move the machine to the left, placing the needle in line with the start of the previous start on the Y axis (front to back). A ruler can be used to line this up if necessary. This is an approximate X axis (left-right) setting. On the Shirley Stitcher, do not hit the stitch button yet. Instead, hit the 'green dot', and press 'set start'. Two cross hairs appear on the screen. Move the machine until they cross over the start point on the screen. This should require movement on the Y axis only (front-back), as the X (left-right) was already established. Keeping the machine at that position, hit the 'red cross' to cancel the selection. Now position the paper panto in position where it nests to your liking. The start of the machine position and the paper start won't line up at this point, since the quilt has not been advanced. The above steps established where the start point is according to Shirley. Carefully advance the quilt (without moving the machine) until the needle is right over the start point on the paper panto. To test, hit the 'green dot' again on the Shirley Stitcher, and then the 'set start'. If the cross hairs are still lined up on the screen over the start point, and the needle lined up on the quilt/paper panto start point, then hit the 'green check' to test it. The machine will go through the pattern without stitching. Hit pause at any time to stop it. To check other points, I once again hit the 'green dot', then 'set start', and move the machine, watching the cross hairs on the screen. I'll set those cross hairs on a high spot on the top of the panto on the screen, then look to see where the needle is on the quilt. If the spacing is good, I move to the stop point of the panto on the screen. This makes sure I have enough panto and enough room on the side of the quilt. Then hit the 'needle' button, and green to go to stitch it out. Halfway through this quilt, I did have to make a left-right adjustment to the pattern in Shirley, as my start point kept drifting left. But one hit to the right move button solved that problem, and I was on my way again. I hope this explanation is clear, and that you give it a try if you also struggle with the nest feature. This will be a great help to some, thanks for sharing! Love the fabric and the design you are using. That's a great panto design. I am sure you could market that design. Thanks for the info.